At the forum, the president and executive director. Keith Poston. announced the top ten “issues” that PSFNC will focus on in 2016. There’s a PDF that goes with this list. Quite an interesting, yet predictable list. PSFNC has proven to be an extension of DPI over the years. What they both say and what they both do are often coordinated to achieve desired policy, fiscal and politically tied outcomes. Make sure that every problem in schools tracks back to race. Everything. From the photos of the event, it looks like number one on the list includes stabbing at Taxpayer Bill of Rights (TABOR) some more. A lot of social engineering, buzzwords, BS and Red flags here. That last one… what does “culturally responsive pedagogy” mean, exactly? The bullet points above center around the studies with data suggesting that black and hispanic students are disciplined disproportionately. What these studies never seem to delve into is what exactly these kids are doing, if they deserved said disciplined or what to do about it. Hence we are seeing the rise of the frankly idiotic ‘restorative justice’ movement. For those unversed in “restorative justice”, it’s like a version of the AA steps — you sit down and hold hands with the people you’ve wronged and ask forgiveness. The point is to ‘repair the harm’ one’s ‘criminal activities’ have caused others. California teachers are being forced to love it. This list also reads a whole lot like President Obama’s ‘wish list’ for school discipline. This also ties right into the edict handed down in 2014 to school districts by both the US Dept. of Education and the US Dept. of Justice in a joint ‘Dear Colleague’ letter. Expect to see Priddy’s name might sound familiar if you’ve been paying attention to NC’s making use of the ERATE fund for school connectivity. View the full Board of Directors. Of note on the list is Carolina McCullen, of SAS. Forum members are a who’s who of Big Biz in education, General Assembly members past and present and of course, the Ann Goodnight of SAS. Of Note are Supt. June Atkinson, NC State Board of Ed chair, Bill Cobey. Other noteworthy members are Andre Peek, who co-chaired the Common Core review commission, Karl Rectanus who ran the NC Chamber’s Common Core campaign (Hire Standards). View the list of major supporters, which include BluePrint NC’s biggest funder, Z. Smith Reynolds. The Z. Smith Reynolds foundation gave PSFNC $80,000 in 2014. According to the NC Secretary of State, PSFNC is a 501(c)3 that first filed with the state in 1986. Their registering agent and founding member is John Dornan. Dornan is now writing for another ‘education non-profit’ I’ve written about quite extensively — Education NC. According to the NC Secretary of State, PSFNC employs a professional fundraising consultant called Moss and Ross. Be sure to view the Fundraising disclosure form; this contract is not cheap. Their 2014 IRS 990 filing shows revenue of $1,648,232 dollars. The 2014 990 lists one paid employee, President/Executive Director Lynda Anderson. Anderson was paid a total of $203,600 in that filing. View PSFNC’s 990 forms at Propublica. 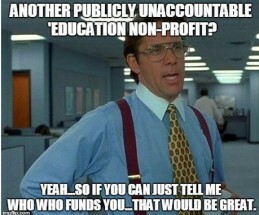 PSFNC does some grant programs – NC Teaching Fellows Program and Education Policy Fellowship program. PSFNC also has a program called NC CAP, which focuses on coincidentally focuses on one of their 2016 focus areas: afterschool care. They also do a lot of lobbying and, in 2015, hired a lobbyist Thomas Bradshaw to represent their interests at the General Assembly. Bradshaw is also on the Board of Directors. This entry was posted in Big Ed Complex, BlueprintNC, EDUCATION, LL1885, The Articles and tagged Keith Poston, NC Public School Forum, NCSpin, Public Schools Forum NC. Bookmark the permalink. Good job exposing another left wing nonprofit advocacy group. Does this organization receive any state funding? If so, their activities and the salaries of their executives should be brought to the attention of key committees in the NCGA.